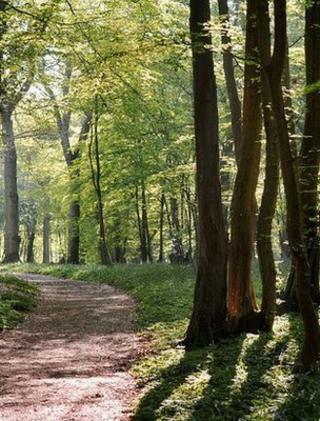 The government has announced that it will not sell off publicly owned forests in England. It says it will create a new public body that will hold in trust the nation's forests for future generations. Environment Secretary Owen Paterson was responding to a report that called the estate a "national asset" that should not be sold off. He also announced that the policy of selling off 15% of the estate to cover costs would be rescinded. Mr Paterson gave few details of the new, independent body that would own, maintain and safeguard the public forest estate except that it would be set up in the longer term. "The new body will have greater independence from Government and greater freedom to manage its resources and maximise its income but with the right safeguards in place to operate for the long-term benefit of people, nature and the economy," he said. The Independent Panel on Forestry (IPF) was established in March 2011 after a ministerial U-turn on plans to dispose of a chunk of its woodlands. The IPF also recommended that woodland cover should increase from 10% to 15% by 2060. But the government says it will only increase this to 12%. However the government is increasing the amount of money that will be spent on forests, boosting the Forestry Commission's budget by £3.5m next year to make up for lost income from sales of woodland. They are also allocating £2m to recognise the additional pressures arising from the outbreak of Ash dieback disease. This increased emphasis on protection was a concern for the Woodland Trust. A spokesperson said they were "broadly happy" with the government's approach but they were concerned that ministers were not putting enough emphasis on improvement and expansions in forestry. "We need urgent clarification on the government's plans on the future of forest services," said the spokesperson. Creating a charter, stating that the public forest estate should be "held in trust for the nation". There are in excess of 1,000 publicly owned forests in England, covering an estimated 258,000 hectares. The Public Forest Estate (PFE) accounts for 18% of English woodlands, and covers about 9% of the nation - one of the lowest percentages in Europe. The estate has been valued at about £700m and costs about £15m per year to manage, equivalent to about 30p per year per person in England.